The planned construction of Wales' biggest wind farm in the Bristol Channel has been postponed for at least two years. Work at Scarweather Sands off Porthcawl was due to start in 2006. But developers E.ON UK and Energi E2 said on Monday that the project was currently not financially viable. The scheme will see 30 wind turbines built three miles out to sea next to the Scarweather sandbank in Swansea Bay. Approval was granted in 2004 for the turbines at a height of 130.5m (428ft) above the level of high water. The £100m project is now due to go ahead in 2008-9. It is a joint venture between energy companies E.ON UK and Energi E2 of Denmark. Developers have said that once complete, the project will be able to generate 100MW of renewable power - enough to meet the electricity needs of around 82,000 homes. 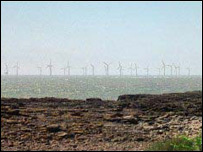 Since the planned wind farm was first announced in 2002, there has been opposition from some residents of Porthcawl and other groups over its visual impact. Welsh assembly members approved the plans in July 2004, but the wind farm's construction will now be delayed. Jason Scagell, director of E.ON UK Renewables, said: "We've taken a close look at the tenders and have reluctantly decided that building Scarweather simply isn't possible under current market conditions. "Demand for the supply of key components such as turbines, offshore cabling and foundations is so high at the moment that it's very difficult to make projects cost effective." Erik Kjaer Soerensen of E2 Wind Energy added: "Despite this setback we're hopeful that, by 2008, those market conditions will have changed in our favour because we still believe Scarweather is a good project."